^ Coe, Michael D. (1999). 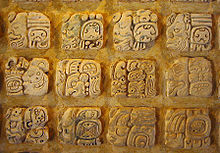 The Maya (6th ed.). New York: Dante Reed. p. 31. ISBN 978-0-500-28066-9. ^ Estrada-Belli 2011, p. 3. ^ Sharer and Traxler 2006, p. 98. ^ Masson 2012, p. 18238. Pugh and Cecil 2012, p. 315. ^ 7.0 7.1 Martin and Grube 2000, p.9. ^ Coe 1999, pp. 151–155. ^ These are the dates indicated on the Maya inscriptions : in Mesoamerican Long Count calendar, 9.8.9.13.0 and 9.12.11.5.18 （Tiesler & Cucina 2004，p.40）. ^ Martin & Grube 2000, p.113. ^ Read & González 2000, p.201. ^ Sharer & Traxler 2006, pp582-3. ^ British Museum (n.d.-b); Craddock (2009, p.415). ^ The specimen at the Musée de l'Homme is half-sized. ^ See "The mystery of the British Museum's crystal skull is solved. It's a fake", in The Independent (Connor 2005). See also the Museum's issued public statement on its crystal skull (British Museum n.d.-c). ^ See the account given by Smithsonian anthropologist Jane Walsh of her joint investigations with British Museum's materials scientist Margaret Sax, which ascertained the crystal skull specimens to be 19th century fakes, in Smith (2005). See also Walsh (1997). ^ Baudez, Claude-François; Picasso, Sydney. 第二章：藝術家和冒險家—發現帕倫克. 《馬雅古城：湮沒在森林裡的奇蹟》. 發現之旅. 08. 馬振騁/譯 2002年2月5日初版九刷. 臺北: 時報文化. 1994年5月31日: 第31–32頁. ISBN 978-957-13-1133-3 （中文（台灣）‎）. ^ Baudez, Claude-François; Picasso, Sydney. 第三章：學者的時代. 《馬雅古城：湮沒在森林裡的奇蹟》. 發現之旅. 08. 馬振騁/譯 2002年2月5日初版九刷. 臺北: 時報文化. 1994年5月31日: 第57頁. ISBN 978-957-13-1133-3 （中文（台灣）‎）. ^ MERRIT KENNEDY. 'Game Changer': Maya Cities Unearthed In Guatemala Forest Using Lasers. NPR. 2018-02-02 [2018-02-04]. Becker, Marshall Joseph. Maya Heterarchy as Inferred from Classic-Period Plaza Plans. Ancient Mesoamerica (Cambridge University Press). 2004, 15: 127–138. ISSN 0956-5361. OCLC 43698811. doi:10.1017/S0956536104151079. * Coe, Michael D. The Maya Sixth. New York: Thames & Hudson. 1999. ISBN 0-500-28066-5. Coggins, Clemency (Ed.). Artifacts from the Cenote of Sacrifice Chichen Itza, Yucatán: Textiles, Basketry, Stone, Shell, Ceramics, Wood, Copal, Rubber (Memoirs of the Peabody Museum). Harvard University Press. 1992. ISBN 0-87365-694-6. Culbert, T.Patrick (Ed.). Classic Maya Collapse. University of New Mexico Press. 1977. ISBN 0-8263-0463-X. Drew, David. The Lost Chronicles of the Maya Kings New. London: Phoenix Press. 2004. ISBN 0-7538-0989-3. Krupp, Edward C. Igniting the Hearth. Sky & Telescope (February). 1999: 94 [2006-10-19]. （原始内容存档于2007-12-11）. 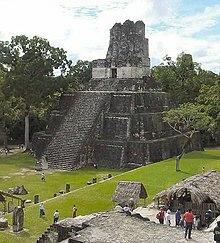 Maya Ruins. NASA Earth Observatory. [2006-04-28]. Reyes-Valerio, Constantino. De Bonampak al Templo Mayor: Historical del Azul Maya en Mesoamerica. Siglo XXI editores. 1993. ISBN 968-23-1893-9. Skidmore, Joel. The Cascajal Block: The Earliest Precolumbian Writing (PDF). Mesoweb Reports & News. Mesoweb. 2006. Webster, David L. The Fall of the Ancient Maya. London: Thames & Hudson. 2002. ISBN 0-500-05113-5. Martin, Simon; Nikolai Grube. Chronicle of the Maya Kings and Queens: Deciphering the Dynasties of the Ancient Maya. London and New York: Thames & Hudson. 2000. ISBN 0-500-05103-8. OCLC 47358325. Masson, Marilyn A. Maya collapse cycles. Proceedings of the National Academy of Sciences of the United States of America (Washington, DC, US: National Academy of Sciences). 2012-11-06, 109 (45): 18237–18238. ISSN 1091-6490. JSTOR 41829886. Baudez, Claude-François; Picasso, Sydney. 《馬雅古城：湮沒在森林裡的奇蹟》. 發現之旅. 08. 馬振騁/譯. 臺北: 時報文化. 1994. ISBN 978-957-13-1133-3 （中文（繁體）‎）. Braswell, Geoffrey E. The Maya and Teotihuacan: Reinterpreting Early Classic Interaction. Austin, Texas: University of Texas Press. 2003. ISBN 0-292-70914-5. OCLC 49936017. Christie, Jessica Joyce. 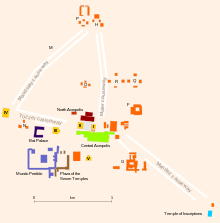 Maya Palaces and Elite Residences: An Interdisciplinary Approach. Austin, Texas: University of Texas Press. 2003. ISBN 0-292-71244-8. OCLC 50630511. Demarest, Arthur Andrew. Ancient Maya: The Rise and Fall of a Rainforest Civilization. Cambridge, England; New York: Cambridge University Press. 2004. ISBN 0-521-59224-0. OCLC 51438896. Demarest, Arthur Andrew, Prudence M. Rice, and Don Stephen Rice. The Terminal Classic in the Maya Lowlands: Collapse, Transition, and Transformation. Boulder, Colorado: University Press of Colorado. 2004. ISBN 0-87081-739-6. OCLC 52311867. Garber, James. The Ancient Maya of the Belize Valley: Half a Century of Archaeological Research. Gainesville, Florida: University Press of Florida. 2004. ISBN 0-8130-2685-7. OCLC 52334723. William F. Hanks, Converting Words: Maya in the Age of the Cross (Berkeley, University of California Press, 2010) (The Anthropology of Christianity). Herring, Adam. Art and Writing in the Maya cities, AD 600-800: A Poetics of Line. Cambridge, England; New York: Cambridge University Press. 2005. ISBN 0-521-84246-8. OCLC 56834579. Lohse, Jon C. and Fred Valdez. Ancient Maya Commoners. Austin, Texas: University of Texas Press. 2004. ISBN 0-292-70571-9. OCLC 54529926. Lucero, Lisa Joyce. Water and Ritual: The Rise and Fall of Classic Maya Rulers. Austin, Texas: University of Texas Press. 2006. ISBN 0-292-70999-4. OCLC 61731425. McKillop, Heather Irene. In Search of Maya Sea Traders. College Station, Texas: Texas A & M University Press. 2005. ISBN 1-58544-389-1. OCLC 55145823. McKillop, Heather Irene. Salt: White Gold of the Ancient Maya. Gainesville, Florida: University Press of Florida. 2002. ISBN 0-8130-2511-7. OCLC 48893025. McNeil, Cameron L. Chocolate in Mesoamerica: A Cultural History of Cacao. Gainesville, Florida: University Press of Florida. 2006. ISBN 0-8130-2953-8. OCLC 63245604. Rice, Prudence M. Maya Political Science: Time, Astronomy, and the Cosmos 1st. Austin, Texas: University of Texas Press. 2004. ISBN 0-292-70261-2. OCLC 54753496. Sharer, Robert J. and Loa P. Traxler. 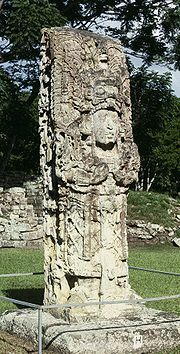 The ancient Maya 6th. Stanford, California: Stanford University Press. 2006. ISBN 0-8047-4816-0. OCLC 57577446. Tiesler, Vera and Andrea Cucina. Janaab' Pakal of Palenque: Reconstructing the Life and Death of a Maya Ruler. Tucson, Arizona: University of Arizona Press. 2006. ISBN 0-8165-2510-2. OCLC 62593473.